Yes, there are many free online ebook file converters. But here is a much better way to correctly convert any ebook file format to a pdf file. Online ebook converters generally give you only one file format you can upload for converting. On top of that, the quality of the conversion may not be perfect. Wouldn’t it be better if you could convert all of your ebook formats and get an accurate pdf file every time? Well, you can, and you can even edit your ebooks before you start converting. On top of all that, you can convert all these different file types and more for free. Pdf (portable document format) files, which were developed by Adobe Systems, are useful if you want to print out parts of an ebook. For students, this is very helpful because so many textbooks are now using electronic publication or ebooks. For authors, being able to annotate and print out ebook files can help with proofreading. It is also a practical way to send an ebook to a reader who does not have an electronic reading device such as a Kindle. Epub format, which was developed by the International Digital Publishing Forum, is one of the most common ebook file types. It is used by most publishers and online ebook retailers, apart from Amazon Kindle which uses its proprietary AWZ file format. No matter what format your ebook is in, epub, mobi or AWZ you can convert to pdf very quickly. Your first step is to download Calibre, which is free open source software. It is easy to use and has a logical user interface. Or in other words, it looks nice and is really simple to understand and use. It is the ultimate file converter for ebooks, so every author should be using it. You can download a version of Calibre for Windows, Mac or Linux, depending on your computer operating system. Once you install the Calibre ebook converter, you are ready to start uploading your ebook files. If you do not know where your ebook files are, you can read this how-to guide to back up your files from your Kindle. For Apple iBooks, this short tutorial will help you find your epub files on your Mac. Once you have located your ebook files, you are ready to add your first ebook to Calibre. Click on the Add Book button, and select your book file in whatever format it is and you are ready to change your ebook to pdf format. Your book will now be at the top of the list. Select your book, and then click on Convert Books to start the short process to convert your epub file, mobi or AWZ. When the new screen open, you will see all the details about your selected ebook. In this screen, you can edit your book details or even add a new cover if you wish. On the left-hand side, there are many tools for editing ebooks, which are mostly used for designing a new ebook after uploading in docx format. So you won’t need to use any of these for a simple epub to pdf conversion. But you might want to investigate the full range of options that Calibre offers when you have some spare time. If you are happy with the details, all you need to do is to click on Output Format in the top right-hand corner. Then you can select from a dropdown list of file type options. In the image above, you can see the arrow pointing to start the pdf converter. Once you select pdf, you will see the program working to convert your book. It usually only takes a few seconds. Now you can go to your Calibre Libray, which is the button in the middle of the top menu, where you can view your new pdf file. 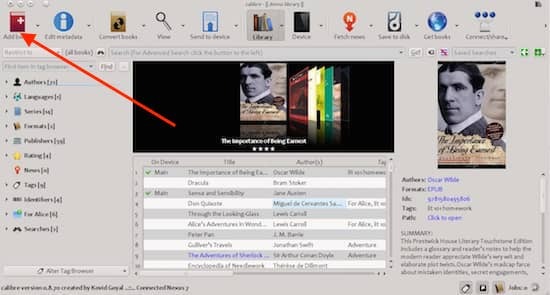 You can open your new file in any pdf reader, and from there you can annotate and print parts or all of your book. That’s it. You have finished your first conversion. Now that you have installed Calibre, you can use it for any type of ebook conversion, or for formatting your new ebooks. Another practical use for Calibre is to use it to store your ebook files, so you have a reliable back up of all your ebooks. You can also read our how-to article about how you can quickly convert Word docx files to mobi or epub. There are many, many ways to use Calibre, so take a look around after you have learned how to convert to pdf and see what more you can do with this free and extremely useful program. It really is like the Swiss Army Knife tool for ebooks and is a must-have tool for all authors and publishers.